advisors. Marie, assisted by her son, did a great job of educating us and stimulating the thought process. One key takeaway is that content directed to clients and prospects should be all about them, not us the advisor. This is also true when it comes to the delivery of financial advice. 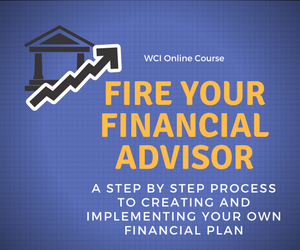 You are the consumer of professional financial advice, why shouldn’t you have it your way? I don’t like guacamole and our local Mexican restaurant is glad to put mine on the side so I can give to wife or son. All too often, investors complain that they can’t or don’t receive the services they need from their financial advisor. I’ve written often on this blog, US News, and elsewhere that everyone should have a Fee-Only Advisor who takes a comprehensive view of their situation. That is my service model and it is the right one for my ongoing clients. That doesn’t mean that it is the right model for your needs and your situation. With the advent of several online advice sites there are many delivery models that you can consider. A good place to start is to take stock of where you might need financial help. Are you looking for someone to analyze your overall situation, tell you what you are doing well, and offer actionable suggestions for areas that need improvement? Are you looking for someone to manage your investments using asset allocation and low cost index mutual funds/ETFs? Are you seeking comprehensive ongoing wealth management advice? Do you have just a few issues and would like to work with someone on an “as needed” basis? Do you want to sit down face-to-face with an advisor several times per year to review your investments and overall situation? Are you comfortable doing your own investing and financial planning, but would like to be able to run ideas by a professional on occasion? Are you comfortable working with an advisor remotely? Are you looking for a low cost online solution? Are you concerned about how your advisor is compensated? About any potential conflicts of interest that may come with their compensation structure? How and how often would you like to be contacted by your advisor? These questions and many others should be considered when looking for financial advice and the method of delivery for this advice. Please feel free to contact me with any general questions you may have or if you are interested in learning more about the services I offer. Reader Question: Do I Really Need a Financial Advisor? Glad you found this post useful.